Saturday was a day for crafting. Try this transformation - it's a great way to add life to vases you have lying around the house. It's been made aware to me that S, fiancé extraordinaire, is a pretty awesome guy. So awesome, in fact, that he goes along with most of my crazy schemes, ideas and plans. When I call him and say, "S, we simply have to go out into the woods to collect car fulls of tall sticks for decorating my parents anniversary party!" He just shrugs and asks when and where (and then brings garbage bags so I don't litter his car with leaves and bugs and things). So a few weeks ago, when I had a brainstorm for funky wedding decorating ideas, he was fairly cool about it. 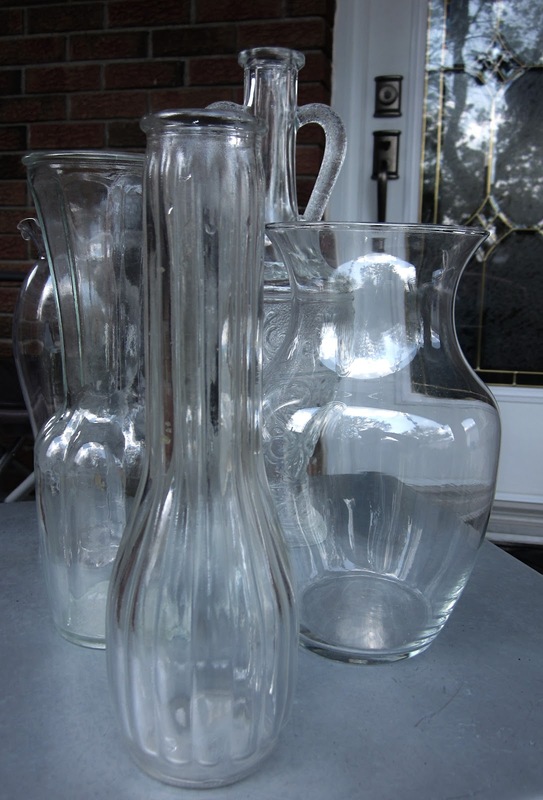 ("S, lets find dozens and dozens of clear glass vases to paint as centerpieces for the wedding!) He was so cool, in fact, that he helped me search yardsales and thrift stores Saturday morning for clear glass vases, and then took me to my favourite arts and crafts store to purchase more glass paint. Four of the vases I picked up at a thrift store, for seventy-five cents apiece (score!) This gorgeous, intricate decanter was from a yard sale for a dollar - in retrospect, they may have not sold it to me had they known I was going to fill it with purple paint. I used PermEnamel for painting. It retails for $5.99 at the arts and crafts store I work at, but went to $1.29 on clearance - and then 50% off all clearance items as a summer sale. For 65 cents a bottle, I purchased many in anticipation of painting a lot of vases for this wedding. 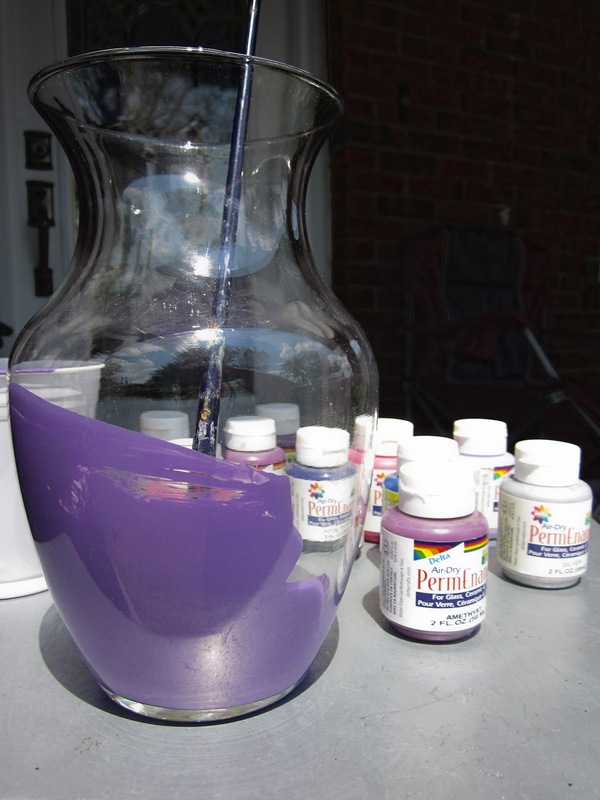 This glass paint is perfect for painting more delicate vases. While other paints require you to bake the item in the oven, this paint dries within hours and cures within a week. It's not as durable as other glass paint, but it is waterproof. I chose several different colours of purple (the amethyst colour is gorgeous), as well as red (raspberry sherbet!) blue and silver to mix up into different purples. A very long paint brush worked wonders for painting the inside of the glass. 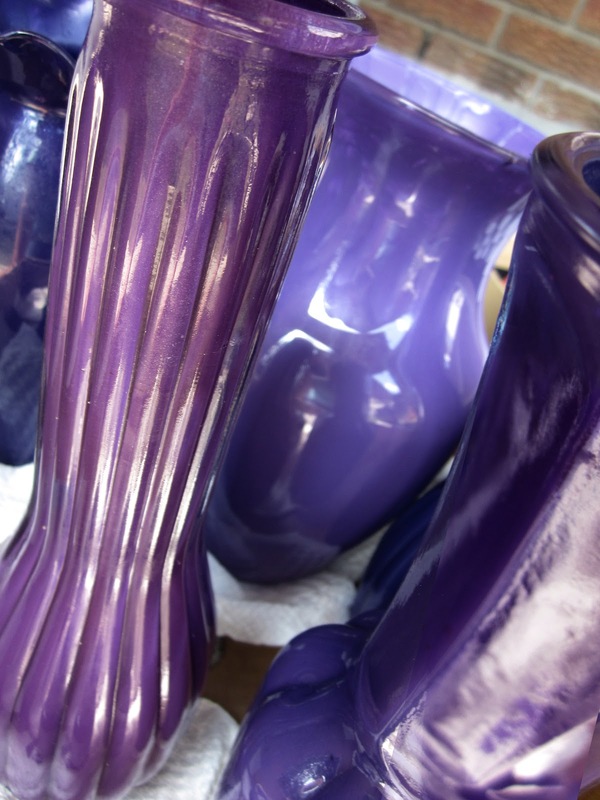 Painting the inside makes for a fabulously professional appearance, but was really difficult for narrow necked vases. Instead, pour paint into the vase and rotate and swish the paint around until the entire inside is covered. The paint cleans up quickly from my hands and the brush with just water. I can't vouch for whether it is washable from clothing - although my shorts are splotched with purple paint, I haven't even tried to wash them yet. 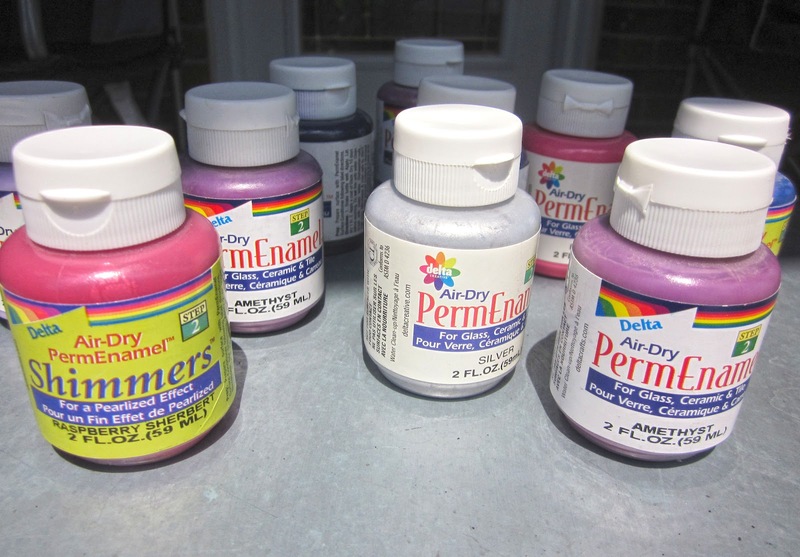 In retrospect, my biggest mistake was doing them in the hot sunlight of the backyard. The paint dried too quickly and wound up being streaky on a few vases. They still look great from the outside, but the insides are mottled. The next batch will be better. S hasn't seen these yet - I'm hoping he loves them as much as I do. 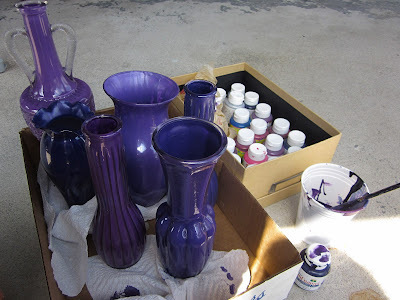 We're hoping to mix and match different shaped vases with different colours of purple paint as the table centerpieces at the wedding - and then fill them with assorted grasses or fronds or sticks...It's an inexpensive alternative to flowers, and we certainly have the time and energy to make them ourselves! Yes, well when you are as talented as YOU are, it looks so easy, but for us mere mortals.... sigh... SO impressive Laur!!! I'm so glad you like it! This craft was a lot easier than you are giving me credit for!